Death* Hazel Engstrom died on 22 October 2013 in Fransciscan Hospice House, Tacoma, Washington, United States, at age 92; Hazel Engstrom Venables died at the age of 92 at the Franciscan Hospice House in Tacoma on October 22, 2013 following a brief hospitalization. 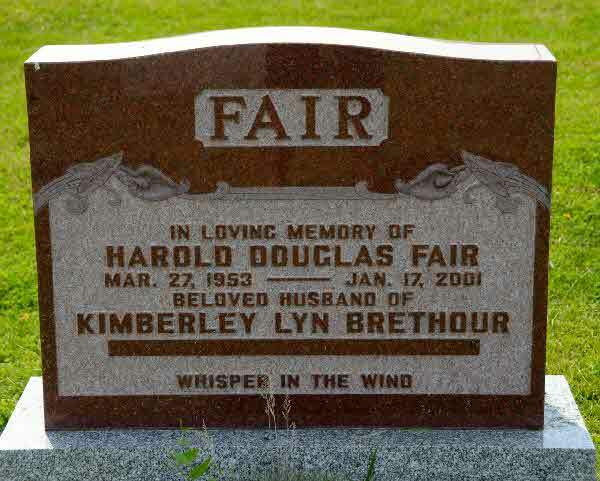 December 11, 1920 in Braham, Minnesota, Hazel Matilda Engstrom was one of four children born to Olaf and Hilda Engstrom. She met her husband Leslie Venables while a student at the University of Minnesota, where she graduated with a BA in Nursing in 1942. 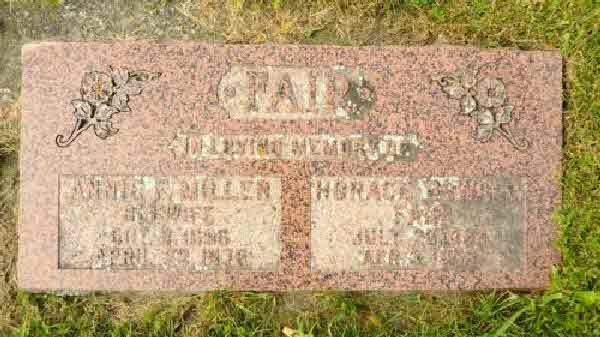 Hazel and Les married on February 19, 1943 in Minneapolis. 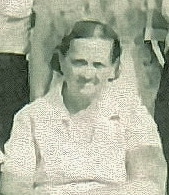 1947, Hazel and Les gave birth to a disabled child, the first of four daughters. That challenge prompted a move to Washington in their quest to find adequate treatment, education, and community acceptance for disabled children and adults. They dedicated their time and energy to making a difference in the lives of countless disabled children and their families throughout Washington. 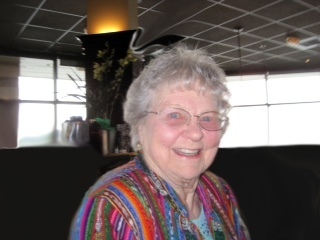 Hazel advocated in the early 1960's for education programs for the disabled in neighborhood public schools in Snohomish County. She was instrumental in starting a number of programs for disabled and adults in the county, including the Little Green, White and Red Schoolhouses, Sherwood Learning Center, and Quilceda Community Services. Information about those programs can be seen at http://www.quilcedacommunityservices.org. 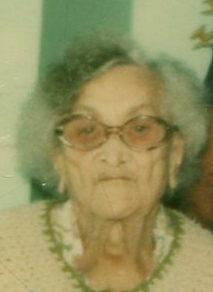 her advanced age, Hazel remained continued to attend board meetings in the last months of her life. Over her lifetime, she volunteered thousands of hours as a recognized leader for the disabled community, and as a member of PEO, Soroptomists and the Silvana Cinderellas. In addition, Hazel worked as a public health nurse, taught coursework at Everett Community College, and she and Les raised their daughters. Together, they built by hand their home in Stanwood and a family cabin on Guemes Island. Hazel was an avid gardener, bird watcher, and seamstress and remained a capable, active, and fiercely independent person up until the time of her death. There was never any challenge too big or too difficult for her to take on. She was a woman of diverse talents and activities and did not shy away from life's difficulties. Her absence will be felt deeply by family and friends alike. 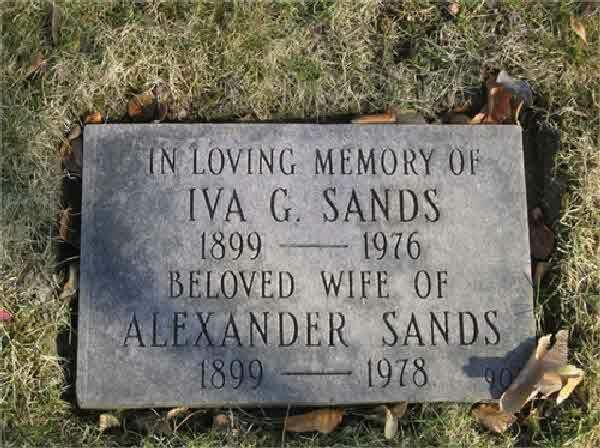 was proceeded in death by her husband Les, who passed away in 2009, and her two sisters, Anne Lively and Clare McCaslin. 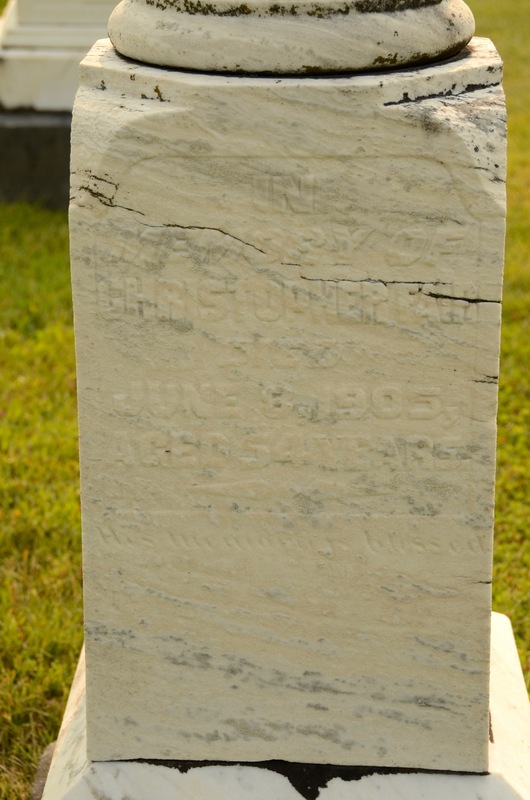 She is survived by her brother Paul (Mary) Engstrom and her daughters Leslie Venables, Karen (Bob) Harper, Vicki (Laurin) Blacken, and Jodi Coy. Hazel has 6 grandchildren, Hans Erik and Nels Olin Harper (Charli), Lars Blacken (Jun) and Kylie Evenhus (Grant), Garrison and Gillian Coy, and 4 great-grandchildren, Maya and Cameron Blacken, Addilyn and Benjamin Evenhus and many nieces and nephews. (quilcedacommunity@qcs.comcastbiz.net) or to the Minerva Scholarship Fund (minervagigharbor@gmail.com) . The family will have a private memorial on Guemes Island. A public celebration of her life will be announced at a future date. 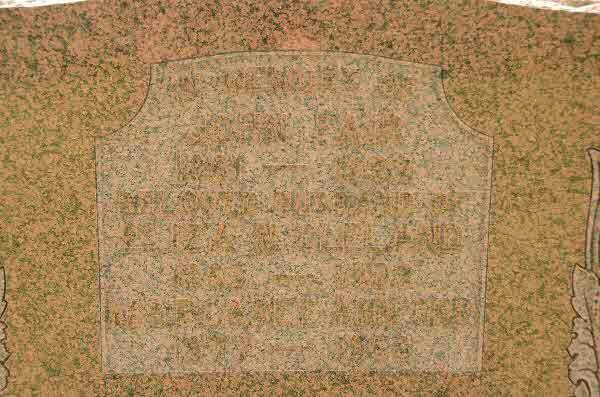 Burial* He was buried in St.Mary's Cemetery, Section M, St. Mary's, Perth County, Ontario, Canada. 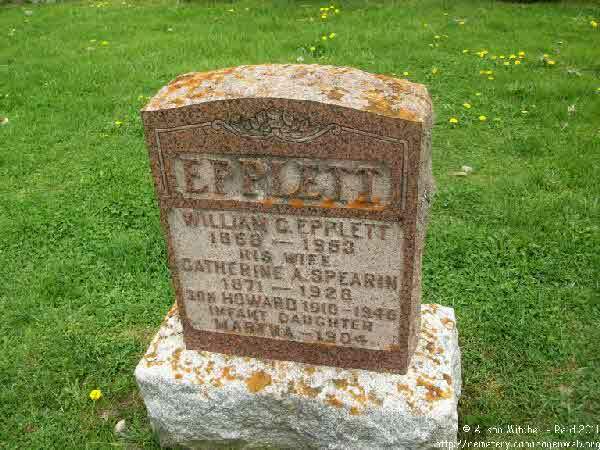 Burial* Martha Epplett was buried in St. Mary's Cemetery, Section M, St. Mary's, Perth County, Ontario, Canada. 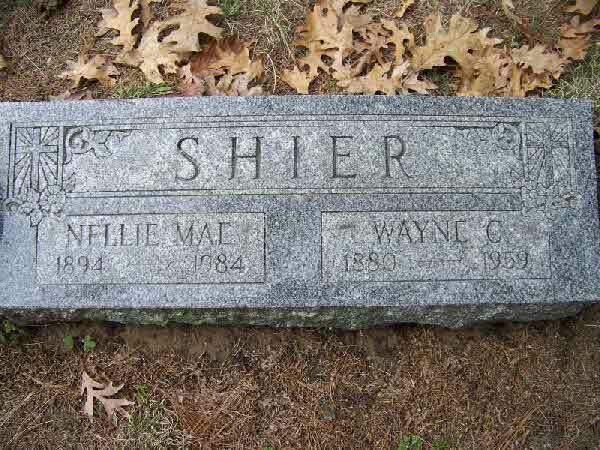 Burial* She was buried in Roscommon Township Cemetery, Houghton Lake, Roscommon County, Michigan, United States. 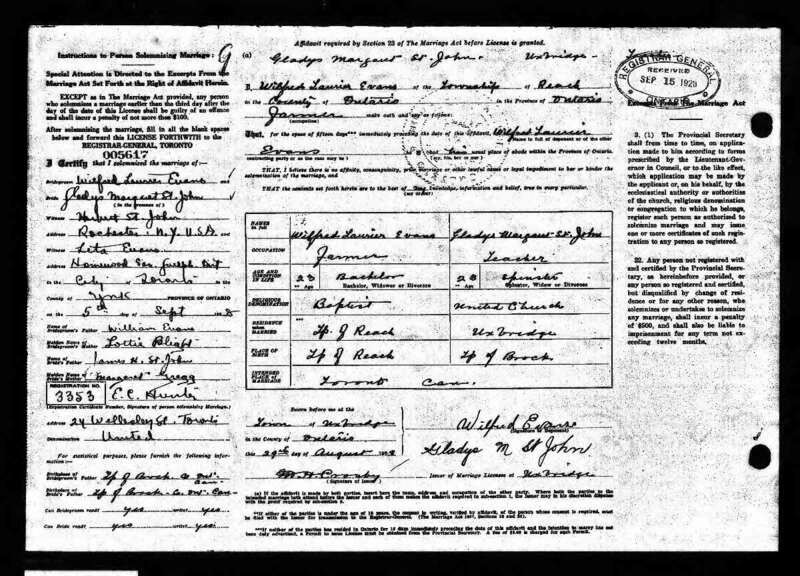 Marriage* Wilfred Laurier Evans married Gladys Margaret St. John, daughter of James Henry St. John and Margaret Jane Gregg, in 1928 in Toronto, York County, Ontario, Canada. [S29] Unknown record type: unknown subject, by unknown photographer; unknown series; unknown repository, unknown repository address. 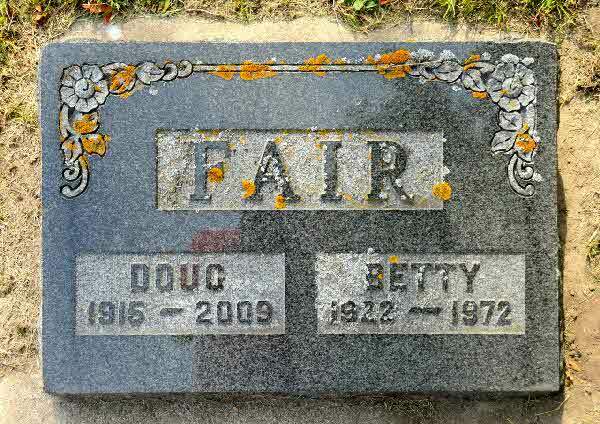 Online unknown url; unknown file name, Death Index for Albert E. Fair. 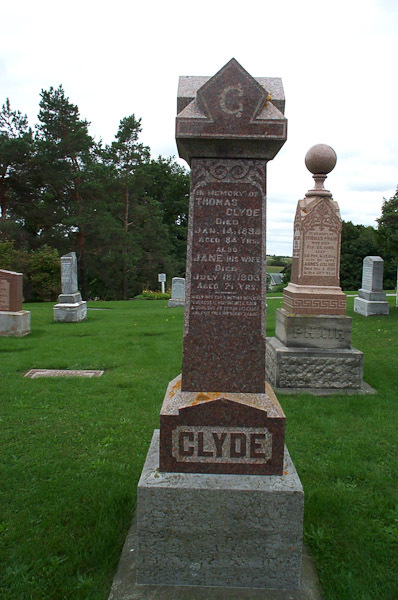 Death* Ann Jane Fair died on 28 April 1918 in Ontario County, Ontario, Canada, at age 59. 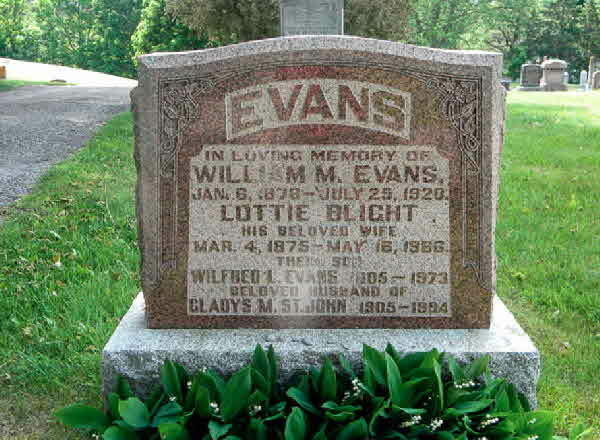 Burial* She was buried in West Brock Cemetery, Ontario County, Ontario, Canada. Birth* Clarence Mathias Fair was born on 26 October 1913. Burial* He was buried on 1 May 2009 in Sunderland Cemetery, Brock Twp., Ontario County, Ontario, Canada. [S30] Unknown record type: unknown subject, by unknown photographer; unknown series; unknown repository, unknown repository address. 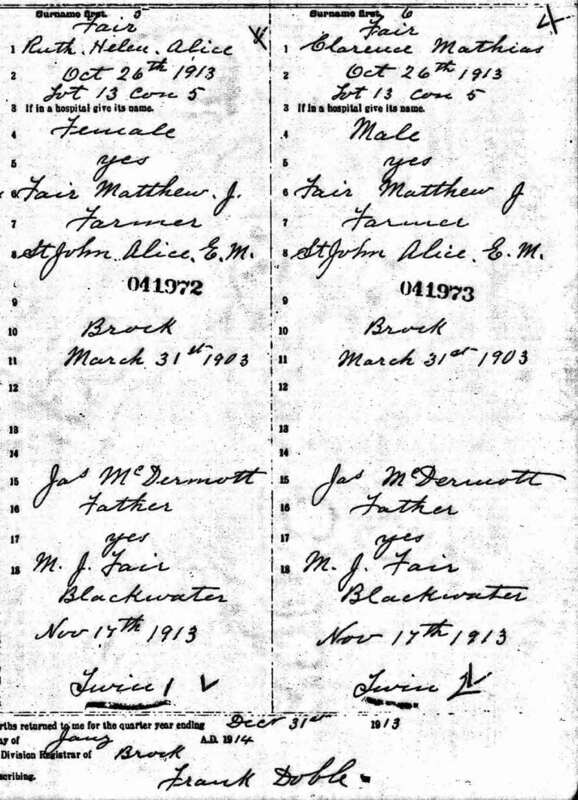 Online unknown url; unknown file name, Death Certificate for Elizabeth Fair. 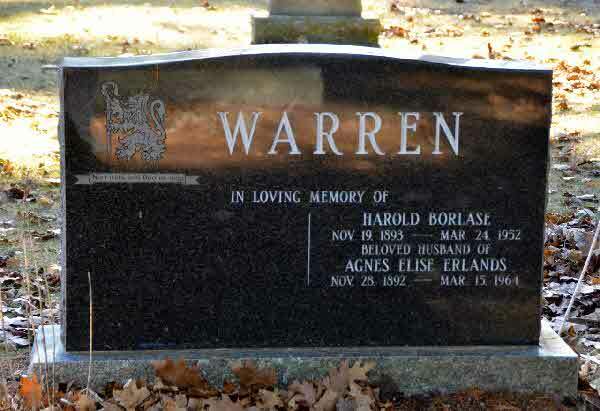 Burial* He was buried in Sunderland Cemetery, Ontario County, Ontario, Canada. 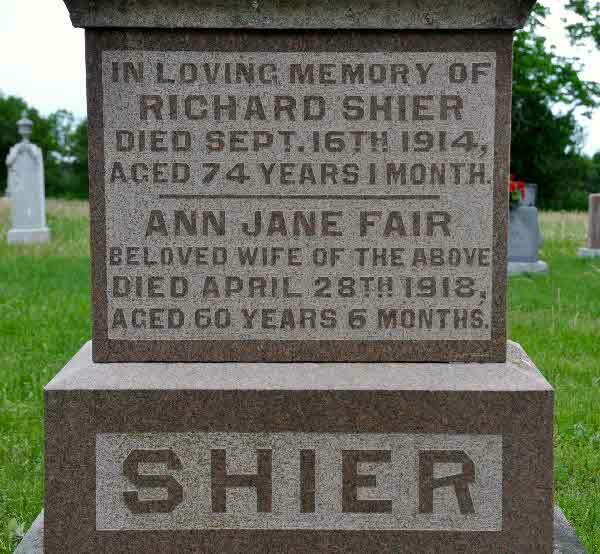 Burial* She was buried in Greenbank Cemetery, Ontario County, Ontario, Canada. 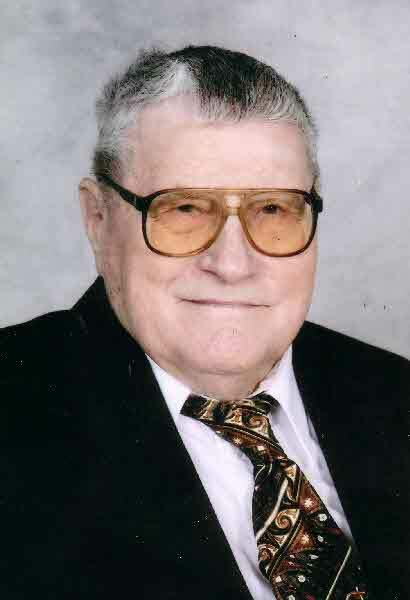 Death* John Romeo Fair died on 22 October 2011 at age 90; FAIR, John "Jack" Romeo: On October 22, 2011, in his 91st year John "Jack" Romeo Fair, CA, retired after a distinguished career at the Department of National Revenue, member of the Thistle Club, volunteer assisting blind curlers, supporter of the Royal Botanical Gardens, veteran servicing radar equipment during WWII in Britain, member of the Acacia Lodge of the Masons, volunteer keeping financial records for St. John the Evangelist Church, and for their housing project "Artaban", served on the Scout's Committee at St. John's for ten years, and assisted residents of Macassa Lodge to file their tax returns. 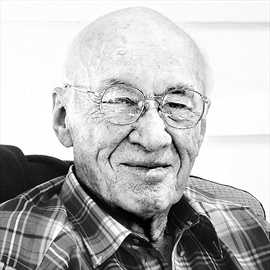 Elected as a life Member of the Institute of Chartered Accountants of Ontario in 1992, Jack was resident at 2 Cottage Avenue in Hamilton for more than 60 years.